All our latest info on new Epson printer related items. Where we have information and technical details for a specific model, it will go on that printer’s specific page as well. Keith has written detailed reviews of many of the printers from Epson, such as the SC-P600 (above) and SP4900 (left). Timeline – how long has any printer been around – what’s getting on in years? +1 for ink denotes need to swap Mk/Pk ink carts. Links are to reviews about the product by Keith Cooper. 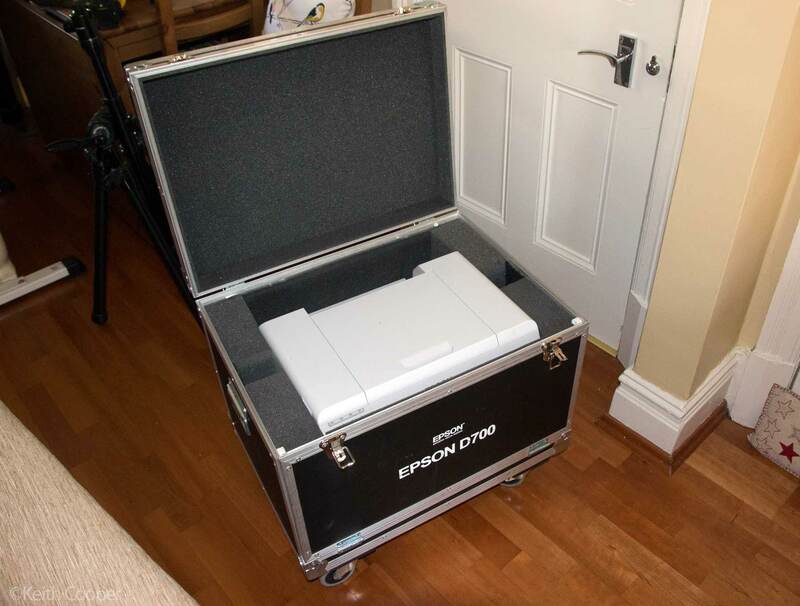 11th Epson UK have kindly lent us a SureLab SL-D700 photo printer for a test and review. This is the sort of printer that many a photolab will use and I’m keen to see just how good results you can get with careful image preparation and profiling. Building on Epson’s success in professional photo printing, the D700 offers a print quality and colour consistency that is inline with Epson’s professional graphics printers. The SureLab D700 is ideal for printing high-quality images, greeting cards or mixed print jobs on demand. This 6-colour printer with inkjet technology has a wide colour gamut and prints sharp images. It uses a professional ink that has been formulated for premium glossy photo prints, produced at high production speeds. 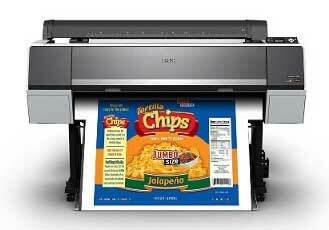 It offers low cost per print and has a high resolution of 720dpi x 1440dpi. It turned up in its own wheeled stage case. 23rd Be careful not to let things get into your printer – the Epson P5000 we’re testing had a head strike. 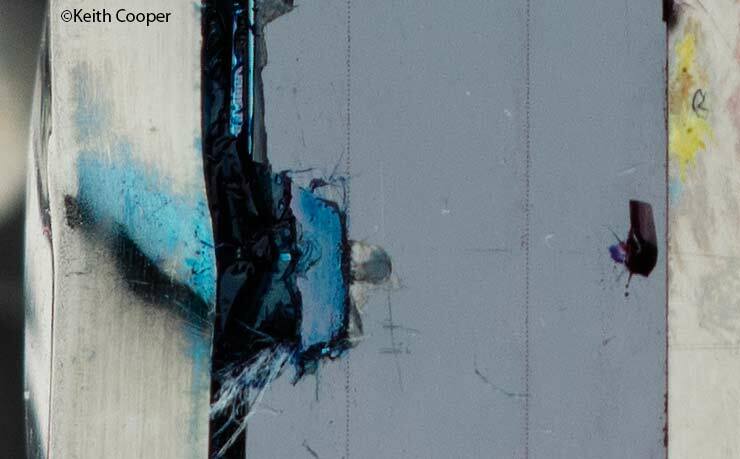 See what damage what we think was a paper clip can cause. I’ve written up some details, as much as anything because I was impressed by the mechanical bits that go into placing tiny drops of ink on paper. Here’s a detail of the print head – those dots are nozzles. The big hole, dented metal and cracks should not be there. 28th I’ve carried on testing the P5000 and even after several absences of over a week, it’s still working perfectly, with not a single manual cleaning needed. 30th My lengthy Epson SureColor P5000 printer review is published. 13th Epson UK have kindly sent a P5000 for me to review. 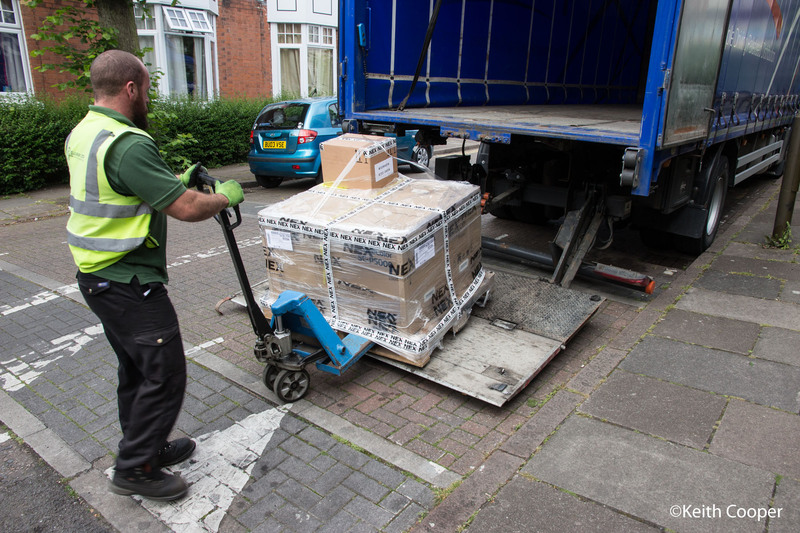 It’s a hefty sized box – we’ll have full set-up details once it’s up and running. 20th We have an XP-960 here for a review. 22nd Keith’s full P7000 review is published. 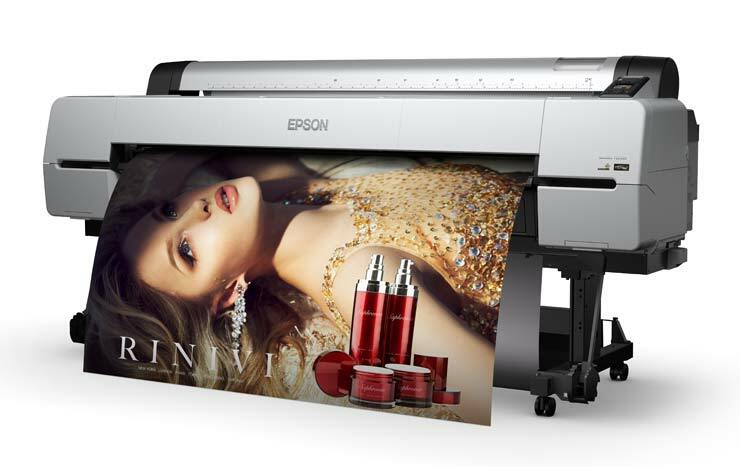 14th January 2015 – Epson announces the launch of the latest addition to the SureColor SC-P series line-up, the 64-inch width SC-P20000. Combining new super-fast printing speeds with the same superior photo quality already seen on current SC-P models, it is ideal for high volume production print environments who do not wish to compromise quality for productivity. As you would expect from a production device, the SC-P20000 is very robust while incorporating a range of innovative technologies and features that make it very easy to operate. Designed for commercial print firms, copy shops, photo labs, high street photo outlets, the SC-P20000 is ideal for any organisation looking for a cost effective in-house production solution. The SC-P20000 can create high-quality, large-format POS, short-term outdoor & interior signage, exhibition & display graphics, promotional graphics and photographs. The printer comes with a permanent PrecisionCore MicroTFP printhead for producing outstanding results up to 2400 x 1200 dpi, even at the highest print speeds. This is coupled with high-precision media feed technology, including a newly developed camera-based paper feed stabiliser and media inductive roller system, to ensure the printer operates smoothly even when unattended. In order to deliver the high quality expected by the marketplace, the SC-P20000 includes a number of features to help ensure the most accurate, precise, productive and reliable results. For excellent colour reproduction, a new Epson UltraChrome Pro 10-colour inkset consistently delivers fantastic looking prints. Blacks will be deep and rich thanks to new high density Photo and Matte Black inks. Better gradation with reduced graininess is achieved thanks to the inkset containing four shades of black ink, and Multi Size Droplet Technology (MSDT), while a new printhead structure means fewer vibrations and more accurate ink droplets and dot placement. To ensure consistency without the need for expensive add-ons, the Epson Colour Calibration utility means users can easily manage their colour reproduction. The SC-P20000 not only produces great results, but it makes operation and maintenance clear and simple, allowing users to enjoy hassle-free production printing. Getting started is easy with a clearly illustrated user guide and colour LCD Panel. When it comes to handling, changing and switching media, the process is quick and effortless. During printing, a transparent printer cover window and roll cover window allows users to check the status of printing and remaining media. After printing has finished, the position of the printhead means that it can be cleaned by the user, along with the ink cap, to help save on maintenance costs. User efficiency and workflow can be improved further with an optional Adobe post script module; while an optional HDD allows jobs to be reprinted directly from the printer panel, without the need for a PC. 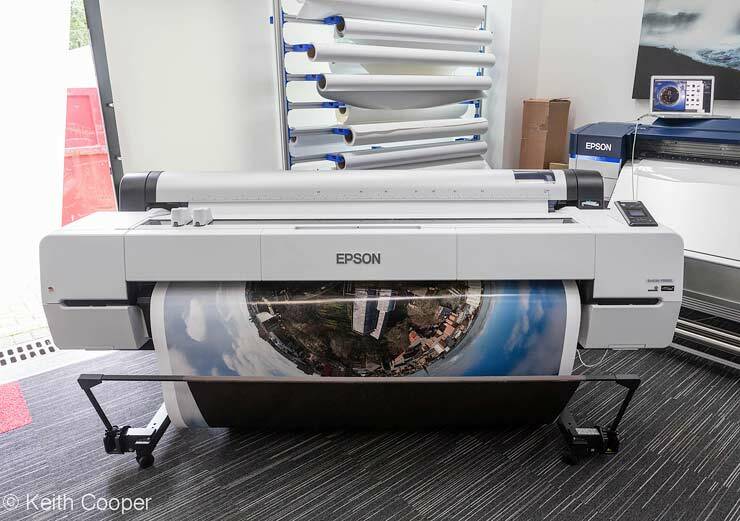 14th January 2016 – Today Epson UK unveils a new range of professional 64-inch signage printers that combine robust engineering with new design and production features to deliver market-leading quality at the fastest possible speeds, precise repeatability and long-term durability. Marking the culmination of extensive market research, customer feedback and end-user testing, the new SureColor SC-S series offers users a precise and accurate way to create high impact, durable and profitable signage and display graphics. Complete with exceptional service and support, the range requires minimal user intervention and delivers increased uptime to help businesses maximise productivity. – SureColor SC-S80600: combining performance and application flexibility, this top-of-the-range model features dual PrecisionCore TFP printheads and 9/10 colours: CMYKLcLmLk + red and orange, and can also be configured to use white or metallic silver. Users can easily switch between white and metallic ink to suit job requirements. This flexible printer delivers print speeds up to 95.1sqm/hr in single-pass banner mode, and up to 12.5sqm/hr in 8-pass film mode. – SureColor SC-S60600: ideal for fast turnaround, high print volume environments featuring dual PrecisionCore TFP printheads (CMYKx2) this printer produces high quality vinyl output at 29.4sqm/hr, banners at 52.3sqm/hr and can print up to 95.3sqm/hr for single-pass applications. – SureColor SC-S40600: perfect for high-quality POS graphics and signage, this affordable, entry-level, four-colour printer features a single PrecisionCore printhead and delivers up to 58.4sqm/hr productivity. Every single component of these printers has been entirely designed and manufactured by Epson to ensure seamless operation, maximum productivity and guarantee the highest professional-quality results. Everything about the design of the new SureColor SC-S series is centred on improving the printing experience for the user and reducing cost of ownership. Set-up is quick and simple and, once printing is in full flow the large clear panel offers a view of the printing area, while internal LED lights allow for easy inspection at the point of printing. From outdoor signage to high-end interior displays and décor, the range can create stunning results on a range of coated and uncoated substrates. Exhibition displays, posters and backlit panels, POS materials, vehicle wraps, wallpaper and photo canvases are all produced with unrivalled accuracy thanks to a new Precision Media Feeding System. This facilitates motorised roll-to-roll media handling with a highly advanced auto-tension control (AD-ATC) system for extremely accurate media feed and take-up. Anti-static, wide-diameter pressure rollers will help optimise grip and feed accuracy, while an innovative media path will enable a consistent media feed for truly unattended roll-to-roll printing up to roll weights of 45kg. Maxmimum uptime and productivity is further optimised by automatic media alignment and setup which allows fast switching between media types. Automatic printhead cleaning, including a newly-developed fabric printhead wiper system, will virtually eliminate printhead maintenance. Featuring Epson’s latest-generation permanent PrecisionCore TFP printheads with variable size ink droplet technology, these new high-performance printers produce consistent 1440 x 1440 dpi output at ‘best in class’ print speeds. In addition, new hardware enhancements offer greater resistance to head strikes and new Precision Dot screening technology help deliver flawless output on difficult media, including cheap monomeric vinyl, even at fast print speeds. The new SureColor SC-S range uses Epson’s new formulation UltraChrome GS3 inkset. 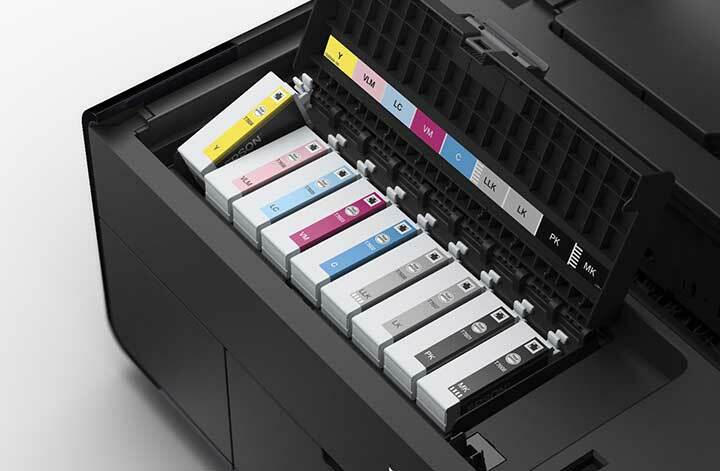 With a RRP of £74.07 + VAT for 700ml CMYK ink cartridges, it is quick drying and low odour. As well as a substantial reduction in ink price for the new printers, Epson expects PSPs to see a significantly lower ink consumption as a result of the improved chemistry in the GS3 inkset. The result will be a big improvement in total cost of ownership compared to other printer options on the market. The new printers allow users to produce a wider colour gamut than ever for highly accurate and repeatable colour reproduction. The top-of-the-range SC-S80600 also benefits from the addition of light cyan & light magenta, red, orange, white or metallic silver inks to expand the colour gamut and application possibilities even further. This model is ideal for those PSPs producing graphics requiring accurate brand spot colours. The new SureColor SC-S range is energy efficient and delivers fast drying graphics with high abrasion resistance and prints that are durable outdoors for up to three years without lamination. In the unlikely event that a problem does arise, Epson has it covered. The products come with a two-year warranty as standard to give customers added peace of mind. For those who want to benefit from Epson’s exceptional service and support for longer periods of time, extended warranty options are also available. Plus, all users can take advantage of the Epson SureColor Academy for training, useful tips and tricks, ongoing support and access to a wide range of regularly-updated media profiles. In the UK and Ireland, the SureColor SC-S printers are supplied with an Onyx RIP as standard and are compatible with a wide range of other RIPs. January 1st A comment (thanks) reminds me that the SP4900 was the only ‘big’ printer not replaced last year and that a major update is on its way, but no ETA yet. 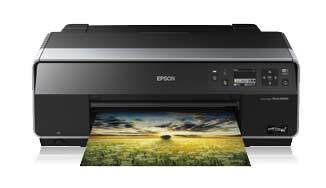 30th We’ve an Epson P400 on the way for a review – any specific questions, please let me know? These replace the 7890/7900 and 9890/9900, but not the 4900. 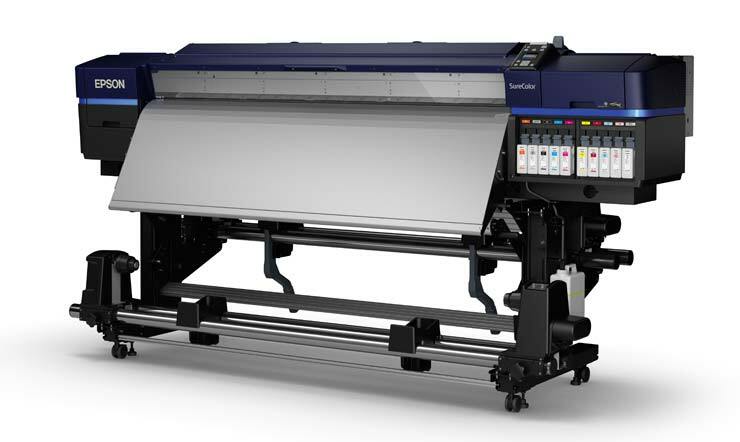 September 14, 2015 – Epson is once again redefining large format commercial ink jet printing with the announcement of the SureColor P-Series line-up. Incorporating the latest imaging technologies, including Epson’s PrecisionCore TFP printhead, the new P-Series printers deliver extraordinary performance for the professional printing industry along with unparalleled Colour matching capabilities. Leveraging Epson’s UltraChrome HD eight-Colour ink set, the 24-inch SureColor P6000 and 44-inch SureColor P8000 are designed for graphic designers, commercial printers and photographers. Successors to the award-winning Epson Stylus Pro 900-Series, the 24-inch SureColor P7000 and 44-inch SureColor P9000 incorporate a reformulated Epson UltraChrome HDX 10-Colour ink set for both commercial and flexographic printers, as well as graphic designers, photographers, and fine art reproduction houses. Poised to set new industry standards for commercial and flexographic proofing applications, the SC-P7000 and SC-P9000 are available in a Commercial Edition featuring an all-new Violet ink for expanded Colour gamut delivering output matching 99-percent of the PANTONE FORMULA GUIDE Solid Coated. In addition, the printers are configurable with an optional Epson SpectroProofer UVS in-line spectrophotometer designed to provide automated Colour management and verification-related tasks for a range of proofing applications. Epson UltraChrome HD and HDX Ink: The SC-P6000/P8000 leverage the eight-Colour UltraChrome HD ink and the SC-P7000/P9000 use the 10-Colour UltraChrome HDX ink. Both professional ink sets deliver outstanding Colour with improved black density; new Black ink is 1.5 times denser than previous ink formulation, providing significant improvements to overall contract ratio and optical clarity, and improved Resin Encapsulation Technology delivers superior gloss uniformity. All SureColor P-Series printers are designed to work exclusively with Epson UltraChrome HD and HDX ink1. 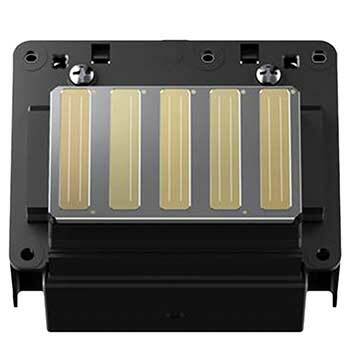 Epson PrecisionCore TFP Printhead: The SureColor P-Series delivers consistent, high-performance with variable size ink droplet technology as small as 3.5 picoliters for remarkable print quality. New enhancements include a new wave form, improving dot placement and accuracy. User-scheduled cleaning cycles improve print head health. The Proofing Standard: Ideal for all commercial and flexographic proofing, the SC-P7000/P9000 Commercial Edition printers include an all-new Violet ink for expanded Colour gamut targeting improved spot Colour matching accuracy. Robust Media Handling: Supports virtually any media type in roll or cut-sheet, from photographic paper to 1.5 mm thick fine art media and poster board. New roll media handling offers user-selectable 3 mm top and bottom margins and improved guide rollers for reduced media surface impressions. High-speed rotary cutter included. Optional Internal Print Server: Internal 320GB print server boosts workgroup productivity by quickly transferring print jobs to free-up workstations; adds print queue management and print job save and reprint functionality. Optional SpectroProofer UVS: Developed jointly with X-Rite, the in-line spectrophotometer provides automated Colour management and verification-related tasks for a range of proofing applications. It supports all current illumination standards for UV and UV-Cut measurement and is UV selectable between M0, M1 and M2. The Epson SureColor P-Series will be on display at Graph Expo, Sept. 13-16, 2015 at McCormick Place in Chicago in Epson’s booth, #841, highlighting graphic design and commercial proofing applications. 3rd It’s looking like a busy few months in the printer business – large and small. We’re hearing that quite a few ‘significant’ printers are on their way from both Canon and Epson. 1st Epson UK announce a new printer. The SC-P400 replaces the R2000 and will ship in November. 1st September 2015 – Epson’s latest A3+ pro-photo printer combines a lightweight, stylish and compact design with many features for creating professional-quality prints on a range of media. Combining pigment inks and advanced connectivity features in one affordable package, the SC-P400 is ideal for amateur photographers and photography enthusiasts alike. Amateur photographers and photo enthusiasts can now create impressive, professional-quality prints with the SC-P400. Utilising a seven-colour UltraChrome HiGloss 2 ink-set with gloss optimiser means photos will have vibrant colours and a uniform smooth gloss finish. The inks are delivered onto the page by a printhead that creates the smallest ink droplet size of any A3+ photo printer on the market, ensuring incredibly accurate prints. Creating professional-quality prints in sizes up to A3+ is easy and – thanks to a wide range of supported media – stunning photographs can be displayed in a number of ways. For users who desire prints with a museum-quality appearance, the SC-P400 includes a fine art paper path that is extremely easy to use as it has a rear-loading tray. Printing on roll media is optimised with two roll paper holders that allow accurate printing on two-inch core media. If users require thicker photos, rigid media of up to 1.3mm is also supported, while CD and DVD printing is also possible. More flexible than ever before, the new model comes with a range of advanced connectivity features, including Wi-Fi printing. Whether you are using a smartphone or tablet, by simply downloading the iPrint app to your device, you can quickly and effortlessly print photos wirelessly. The printer can even be connected to a local network in a photo lab or office thanks to its built in Ethernet capability. Furthermore, it is the smallest and lightest A3+ photo printer with pigment inks available on the market1, meaning users can save precious desk and counter space. Its stylish and professional design will also make it an ideal addition to any modern home, studio or office. The SC-P400 will be available to buy from 1st November 2015. Roll paper holders allow users to easily print on 2″ core media. 24th After writing the review,several people asked questions about aspects of using the P800, so I’ve added a few more examples and images. 24th I’ve just published a detailed SC-P600 review – it’s quite long, but please do ask if you feel there is something I’ve missed out. 29th I’ve just had an SC-P600 sent from Epson UK for a detailed review. If anyone has any specific questions, please let me know and I’ll try and address them during testing. 19th I’ve recently heard of an Epson R3000 that had started excessive cleaning cycles after a year of use. The owner had recently attached the printer via a new surge-protection power cable/extension unit. Getting rid of the anti-surge device cured the printer. Epson suggest that they intend to introduce quite a few SureColor printers over the next year, so maybe updates for the R2000, 4900, 7900, 9900, and 3880 before too much longer. I’d note that they will continue with exisiting printers for some time – start looking for good deals, and remember that the current printers are all pretty good. The SureColor SC-P600 is Epson’s top-of-the-range A3 photo printer and combines superb quality, high productivity and superior wireless connectivity in a compact and affordable package. The SureColor SC-P600 features Epson’s new UltraChrome HD and Vivid Magenta ink to produce excellent quality prints. The new nine-colour UltraChrome HD inkset can reproduce a very wide colour gamut and with a 2.84 DMax – the industry’s highest black density — produce deep, rich blacks and ultra-smooth tonal gradations. Ideal for amateur and semi-professional photographers, the SureColor SC-P600 will also appeal to businesses, such as architects, real-estate agents and advertising/design agencies, that have a regular requirement for high-quality colour presentations. The new printer provides exceptional Wi-Fi Direct wireless printing connectivity from smartphones, tablets and PCs. For the first time on a single-function Epson A3+ photo printer, Epson Connect is supported. Google Cloud Print is also supported. Designed for medium-volume production, the SureColor SC-P600 outputs an 11 x 14 inch print in only 153 seconds. Twin paper paths enable A3+ printing on a wide variety of photo and fine art papers, canvas and thick media, while the machine’s roll-paper capability is perfect for high-impact panoramic images. The 2.7 inch, colour touch panel interface, unique to the SureColor SC-P600 in the A3+ sector, makes it simple to set up and manage, even without a PC. The SureColor SC-P600 printer will be shown for the first time in Europe at Photokina (Stand B11, Hall 2.2, 16th-21st September 2014, Koelnmesse, Cologne). 2nd Whoops, I should check model numbers a bit more closely… The 3890 has been around for years! Epson already has a 3890 on their Chinese site – it’s their version of the 3880. 29th No signs of anything new at Photokina at the moment, but there are some very good deals for the 3880 going round. The 3880 dates from 2009 and will work well, even if Epson announce a 3890/3900 (or whatever). The new print technologies from last year seem to have been aimed at the ‘SureColor’ range, whilst the x900 range and smaller printers haven’t seen an update for quite some time. 26th After a lot of testing, I’ve produced a new updated version of our free black and white printer test image. 19th No reliable signs of any replacement printers as yet, although it was suggested to me that in large format printing we would see a move to more user serviceable parts when some of the ‘Surecolor’ developments pushed through. The R3000 is reported [thanks] as very difficult to get in parts of Europe – any other difficulties or hefty discounts around the world? “Epson announces the launch of the SureLab D700, its first compact six-colour photo production printer, offering a wide range of media and format options. Combining vibrant, high-quality colour output with reliability and cost-efficiency, this stand-alone printer is ideally suited to photo production businesses, photo shops, event photographers, minilabs and copyshops. In fact anyone who needs to print high-quality mixed sized photos on demand. The SureLab D700 printer will be shown for the first time in the UK at The Photography Show (Stand L50, 1-4th March 2014, NEC). “Epson is expanding its commercial photo production range, with the introduction of the SureLab D7 Studio which will make its UK debut at The Photography Show (Stand L50, 1-4th March 2014, NEC). This scalable and flexible solution can be tailored to suit users’ needs, and used either on the shop floor as a self-service order terminal or as a production microlab behind-the-counter. The microlab features the new SureLab D700 printer and is available from June 2014. 22nd If you’re wondering if a large format printer is for you, then I’ve just finished a new article: So, you want to get a large format printer? – some issues to consider. With mention if business/industrial, I’d assumed it was related to new ‘Surecolor’ products? 20th A suggestion that if we wanted a 3880 printer, that it might be worth holding back a few weeks to see what’s coming. No details though, and no other info anywhere to back this up. 24th There’s been no major printer update since 2011. 2014 is a Photokina year, so what’s Epson going to be doing with that new printhead technology we keep hearing snippets of info about? 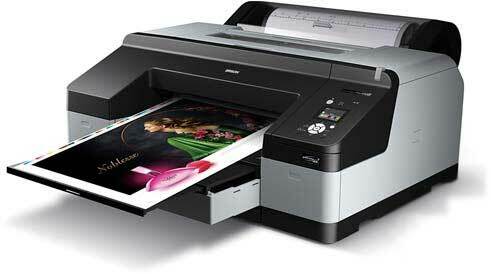 There have been all kinds of large Epson printers announced, such as the SureColor SC-F2000 – at £17k, great for printing T-shirts… but nothing for the fine art/photo market. So, when will we get a replacement for the 3880? 23rd Some time ago I heard that the 7900 and 9900 would last a long while, since certain aspects of the technology were just not going to advance in a hurry. It would seem that Epson do have a new print head technology that they are keen to introduce, so we may yet see quite a major new range of printers, that could include an update to the 3880. The longevity of the 4880 stands out, with its need to swap cartridges for Mk/Pk. So, is a 9 ink 4890 on the way, or is the 4900 the only option for 17″ roll feed? If so, then next oldest is the 3880. So… Epson SP3900 as a replacement for the SP3880 this year? I’d not be surprised to see an all new print head that cuts out black ink switchover, and allows for a gloss coat. The 3880 has been my ‘reccomended printer’ at this size for some time now – I look forward to seeing what can be improved. 19th No signs of anything new in larger printers from Epson during a visit to their stand at the Focus show this month. 15th We’re told to expect a whole new range of medium to large format printers announced in the run-up to photokina – 5 new printers for 2013. Updates for the 3880/4900/7900/9900 and a 60″ ? 12th No details of any photokina related announcements yet. 17th We’ve heard that the 3880 may be getting a makeover for photokina (3890 or 3900?) – not many print related changes, since it’s a pretty good printer to start with. New colour LCD, wireless, and an increase in weight (more solid build). No word on roll paper support though. 10th The 3880 is, I’m told, due for an update later this year. What was not clear was whether it would be a 3890 or 3900. “Existing Epson Stylus* customers can save up to £850* on the RRP when purchasing selected Epson Stylus Pro printers. Loyal customers can save £350 on the 24 inch Stylus Pro 7890 and 7900 Series, £650 on the Stylus Pro 9890 and 9900 Series, and £850 on the 64 inch Stylus Pro 11880. 30th Don’t expect any big advances from the x900 printers for quite some time. We’re told (thanks) that Epson believe that the x900 series are pretty much reaching the limits of some aspects of print technology, and that any significant improvements are some way off. 17th The Epson R3000 A3+ printer is announced. As ever, we hope to have a full review in due course. 11th Epson to announce new printers/scanners at the BETT show in London this month, however we’ve had no hints of any changes in the lineup of larger printers, with the 2880 perhaps most looking like a replacement announcement later this year. 29th We’re told by Epson that the 4880 will remain a current product and available alongside the 4900. 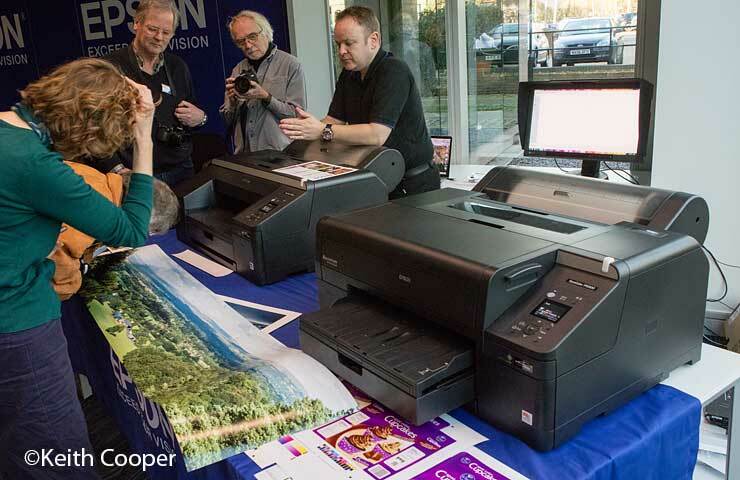 24th No sign of the new printers yet at Epson sites outside of Europe. New printer info pages updated. 30th Epson are to announce 3 professional printers at Photokina. 10th We’ve an Epson 3880 on loan from Epson and will have a full review later this month. 30th A suggestion that the 3800 will be replaced with the 3880 this summer. 12th UK prices to rise? We’ve seen price rises for Canon and Nikon equipment due to currency fluctuations, but it looks as if printers and supplies may be in line for rises. 5th Some initial 7900 and 9900 printers are starting to turn up in the US and UK. 18th With the 7900 and 9900 due in the autumn, there are some pretty good deals around for the 7880 and 9880 – however I noticed that the 3800 is included in the discounted printers, but not the 4880. 31st Stiil only 9900/7900 details from Epson Australia so far – look for availability in the Autumn. 29th 7900 and 9900 will have X-Rite spectrophotometers in them. 23rd looks like our guess earlier was right – we have initial info on the R2880. Epson have also launched a new Photoshop Plug in, this is available as a free download and will support a limited number of previous Epson printers (Epson Stylus Photo 1400, R1800, R1900, R2400, R2880 and Stylus Pro 3800). The new Epson Print Plug-In will be available as a free download from Epson Europe. It supports Mac OS 10.4.3 – 10.4.10 (Tiger), Mac OS 10.5 (Leopard) and Windows XP SP2 and Vista. 23rd May 2008 – Imaging specialist Epson has today launched an innovative new print plug-in for the Adobe Photoshop family of products that provides users with enhanced functionality and flexibility, making colour-managed printing quicker and easier. Engineered specifically for the popular Adobe Photoshop CS and Elements products, Epson designed the software to meet the needs of the users of its Stylus Pro 3800 and its A3+ printers, including the new Epson Stylus Photo R2880.Mark Robinson, Senior Product Manager at Epson UK commented: “The new Epson plug-in provides an invaluable tool for the keen photographer, allowing them to increase their efficiency when printing a wide variety of projects. The Epson interface splits the printing workflow into three steps; image selection, layout selection/definition and printer settings and previewing, making the printing process simple and efficient. The window of each step is modular and can be minimised to optimise space on-screen. The layout function automates the layout process, allowing users to select from three layout types; template, index and free layout, which can be arranged over multiple pages. Over 170 templates, ranging from credit card sizes to A2 are available as standard and users can even create custom templates and save them for regular use. Once the layout is selected, images are simply dragged and dropped into the template and can even be cropped as needed. Colour management can be automated for both direct colour management using the printer driver, and ICC profile-based colour management. Users can also specify their own ICC profiles for specific print media. The preview function provides a fast and easy way to proof the final print layout before printing begins. Two more printer designations we keep hearing about are a revised 3800 or 3880, featuring the Vivid Magenta inks and a coated (less clogs) print head, such as seen in the x880 series and a 2880 with VM ink and an all new head (and cartridge) design. April 29th More info on the Epson 7900 and 9900 – 10 colour printers at DRUPA? An article about the rumour gets pulled at a printing web site. 19th Are Epson getting ready to launch an ‘Ecosolvent’ (sign printing) based version of the 11880? In an interesting post on the WIP list, there’s the suggestion that it might get launched at the FESPA show in April (Geneva 1st-3rd). This is a Photokina year (September), so we might yet see 3880 or 11880 black ink switching technology appear. November 3rd Is this the end of third party inks and ink supply systems in the USA? I’ve seen several questions on forums about just how long it will be before the 4880/7880/9880 are replaced with new designs allowing black ink swapping like the 11880 and 3880. The lack of black swap certainly came as a surprise, but the smaller x880 series were only announced at the end of July and are only now shipping in any quantities. The picture is of the 11880 head with its 9 sets of jets. Maybe we’ll get the 4900/7900/9900 next year at Photokina, but I suspect 2010 is more likely, since having a major revision of the pro printer line is not something the large format market wants too often. The 3800 is being widely discounted at the moment, with various offers such as the current one at the NY Photoplus, with Epson offering discount vouchers for show purchases. If you’ve not updated your printer drivers for a while, it’s worth checking different Epson sites to see if new ones are available. I generally check Epson UK, US and Australia, since there is some considerable variation in what’s present in different countries’ sites. In-Box = Drivers are already included in the Operating System and the installation process will start as soon as you will plug your product in. Most current Laser Printers are supported using existing printer drivers. Please check back in November. Get the best quality from select Canon and Epson printers. Leopard can use enhanced numerical precision to unlock the printing potential of pro-level colour ink jet printers, using up to 16 bits per colour channel. Make sure you always have the latest printer drivers. Download directly to your system using the familiar capabilities of Software Update.